Well, that’s a new one. 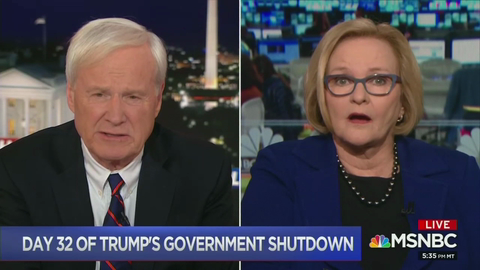 During Tuesday’s Hardball, host Chris Matthews wondered to newly-minted MSNBC political analyst and former Missouri Democrat Claire McCaskill if President Trump truly “cares about” stopping the flow of illegal drugs from the U.S.-Mexico border, surmising that he doesn’t care about putting a halt to drugs that are killing thousands of Americans. McCaskill had just suggested that more people be hired as “port of entry officers” because “[t]hat’s the way the drugs are coming in” when Matthews uttered his ghoulish assertion about whether the President cares about stopping the deaths of innocent Americans.